We travelled north from London together on the Caledonian Sleeper. The tree got the upper bunk, I had the lower one. It had been a long journey for the tree, from Nagasaki, bearing its passport: a phytosanitary certificate that gave it a clean bill of health. 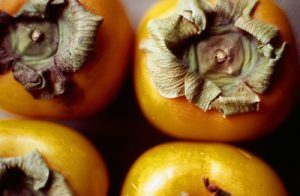 I’d first heard about the tree, a kaki tree, which we call a persimmon, from a friend in Yorkshire. After the 1945 atomic bomb explosion and its immediate death toll of more than fifty thousand (many tens of thousands in following years), very little was left living in Nagasaki. One of the survivors was a persimmon tree. Long years after, in 1993, the City of Nagasaki noticed that the tree was ailing and called for the prominent arborist Dr Masayuki Ebinuma, who tended the tree and also took seeds from its fruit. The seeds were planted at in his hillside farm above Nagasaki, where they germinated and were carefully brought on to become strong saplings. Dr Ebinuma distributed these trees to Japanese schools and schoolchildren, to be planted as symbols for world peace. In 1995, the artist Tatsuo Miyajima was greatly moved by this act and, together with Dr Ebinuma, founded the participatory art project, the Revive Time Kaki Tree Project, whereby schoolchildren all across Japan were offered saplings (by now the collection of seeds and minding the saplings had become an annual event for Ebinuma). The children, parents and teachers all became equal partners in the art project: its aim to foster world peace. As a strong advocate for nuclear disarmament for decades, in 1999 I began my correspondence with Miyajima, to see if such a sapling could be brought to Glasgow. At that time I was Poet in Residence at Glasgow’s Botanic Gardens, so it seemed fitting that it might be planted there, where it could be tended by hugely experienced curators and gardeners. It was not until 2002 that the wee kaki sapling, bearing such a burden of hope and symbolism was finally planted. Bureaucracy moves slower than artists; both Miyajima and I learned a sort of patience in those three years, finding and getting all the necessary permissions. I visited him at his studio home in Ibaraki, near Tokyo, to speed things up. While the visit was fruitful, I still had not seen the tree itself, so the following year I travelled back to Japan and visited: first Hiroshima, then Nagasaki, where I met with Ebinuma and visited his farm in the mountains. We ate his apples, his melons, the juice running down our chins. We drank good whisky, which I’d brought and we spoke of his childhood, fleeing to the hills from Nagasaki, where often the only food to be had was apples from old orchards. He explained that his passion for peace and his life as an arborist stemmed from these experiences. The tree itself (one of many planted in a row in a polytunnel, each neatly labelled) and I finally made acquaintance. I was moved and in Japanese fashion bowed deeply to the tree and to Dr Ebinuma. The long journey to Glasgow began, though I was prevented from carrying the tree with me by airline regulations (the tree, though I regard it as a sentient being and though it is also a symbol of world peace and hope and a full statement of the only people in the world to have suffered an atomic bomb blast, needed to travel in the hold). We began our separate journeys, but were eventually reunited in London. The tree slept soundly on the Caledonian Sleeper. I don’t think I slept until the tree was planted in Glasgow’s Botanics, appropriately, not just by the Lord provost and dignitaries, but by folk from the Clydebank Life Story group, whose bombing during that same war meant a chord was struck with them. Though the Lord Provost turned the first soil with a silver spade, the actual planting was done by children from East Park School. As I wrote at the time, the event was celebrated by hundreds of people from across Scotland and further afield, reading poems, telling stories, making films and photographs, singing, dancing; but above all, quietly contemplating the tree and its meanings. The simple and poetic act of planting a tree became a symbol for what was about to happen again in the ‘theatre of war’ and our collective opposition to that war and all war. The tree remains. It is marked by a wild stone inscribed with the words Nagasaki — Glasgow and a two-word poem. It grows from strength to strength, year on year. I relish the night I spent on a train, heading north with such a tree. Shortly after the planting, the kaki tree was stolen. It never re-appeared. I now think of it blooming in a suburban garden or allotment, bearing fruit, shining out its own serenity, not minding at all the intentions of the thief. Unknown to whoever stole it, I had been given two saplings from the same seed source. After careful growing on in a secret place, with a bought-in persimmon tree to fill the gap, the second tree was planted out as a strong sapling in place of its sister, the original, in that spot. In 2006 this splendid kaki tree bore its first fruit, a rare event in these northern latitudes. I kept some seeds from that fruit. I wrote at the time: If a tree is uprooted it dies. It is not possible, however, to uproot a symbol. The symbolic is a product of intention. Our intention for the kaki tree was for it to stand (in our place) as a sentinel for compassionate behaviour towards each other, towards that which shares the planet with us and as a light for the possibility of peace. That intention cannot be uprooted. Nor can it be stolen. Gerry Loose is a poet and horticulturalist, whose poems are as at home in the gardens he designs as they are on the printed page.